Ultimately the work of platforms is to expose in at least two directions. But exposure to what, and according to what rules of the game does this process adhere? The idealism of boundless global connection and encounters proffered by early cyber-utopianism, now seems like a quaint, almost laughable notion in view of flame wars, trolling, echo-chambers and bots. Laughable, if it were not conceptually still built into the corporate missions of some of the tech giants like Facebook, whose 2017 revised slogan to “Give people the power to build community and bring the world closer together”17 underwrites their business model where they traffic in this nostalgic idealism. What are the limits of empowerment for our ‘communities’ when we can merely participate in them, but possess no power in the decisions governing the protocols and ecosystem of our interactions,18 including the very value extraction of our ‘community’ connections. Furthermore, how does this privileging of community within the quasi-public space of the platform effect the public sphere as such, where we increasingly see the two (importantly) distinct domains seeming to collapse into each other? Quasi-public life, following the rules of the game of platform logic (as it currently exists) induces less the proliferation of foreign connections and unfamiliar encounters, but rather the propagation of community enclosures composed of ‘friends’ (in its wholly vacuous sense today), followers and like-minded users, that are nourished by pre-emptively personalized feeds of news and search results. To be clear, this is not an argument against the formation of communities who share common interests and/or struggles, are empowered by and possess a stake in belonging and shaping said community. It is simply to highlight their structural premise of inclusion based on similarity, which is distinct from the negotiation of uncommonness necessary for public life. When the two domains are conflated, or operationalized as exchangeable, the grammar of the public sphere dissolves into the specific dialects of communities, whose particular forms of life can no longer interface or be mutually understandable. At which point the possibility for political agonism fundamentally breaks down at the great cost of plurality – a plurality which must be understood as radically different from the sheer multiplication of singular perspectives. 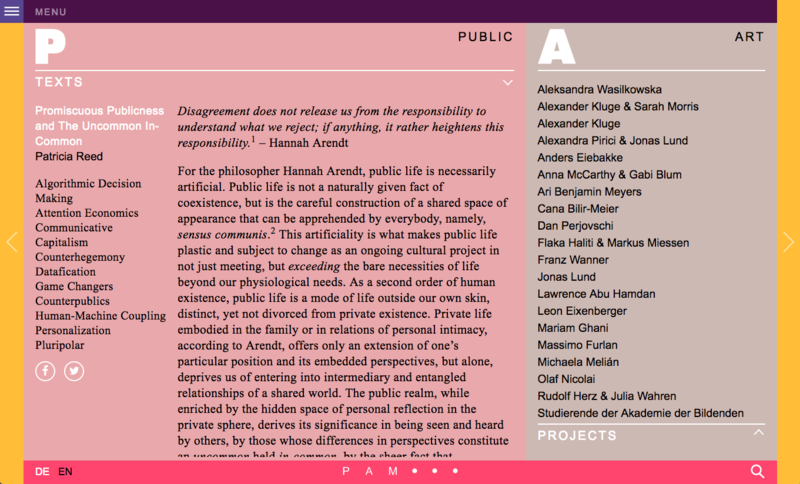 Patricia Reed, "Promiscuous Publicness and The Uncommon In-Common," on Public Art Munich 2018, available here.